AFTER THEIR near miss in the Betfred Championship, head coach John Duffy has pledged Featherstone Rovers will learn from the experience. Rovers finished fifth, missing out on a place in the Qualifiers by one point, despite a stunning 30-12 win at leaders Toronto Wolfpack last weekend. They will now go into the Championship Shield, along with the seven teams who finished below them and Duffy admitted it is a case of what might have been. “We were a point away from getting into the top four,” he reflected. 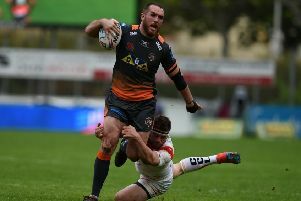 “There were a couple of games this season – London at home and Halifax at the Summer Bash – we were in control of until the last few minutes and we just made a couple of errors. “You just can’t have a minute off in this division and that’s what cost us. It is a massive learning curve for me and all the players. The win in Canada will send Rovers into the Shield in confident mood. Duffy said: “Our fans were unbelievable, about 100 of them went out there which is a fantastic effort and I want to thank them. Featherstone now go into the Championship Shield knowing they will play Leigh in the final. The top two teams after the initial seven fixtures meet in the final and as both Rovers and the Centurions are 16 points clear of the third placed team, and there are only 14 points up for grabs, it means neither can be caught. The only issue to be resolved is who will finish top and get to host the final.